1)This item includes an "Install manual" however we still strongly recommend you to ask a local electronics technician for installing job. 2)You must know this install work involves very delicate mechanical techniques so if you stepped wrong process it might cause serious damage to your Electone. 3) Installation is at your own risk. We can introduce you to Electone technicians to install Vita-rise unit to your ELS-01 series Electone in Australia. His installation fee is AU$500 + travel cost from NSW. YAMAHA found an issue that after initial release of the first version Vitraise unit to ELS-01/01C, registration memory button's LED would not turn on. If you are trying to purchase a Vitarise unit from another company it could be the old version of Vita-rise unit. To fix this problem please follow the following instructions. 1)If you don't replace PN1 sheet registraion memory ramp will not turn on. You will need to replace PN1 Sheet for following serial number models before you install ELSU-V02 to 01/01C. 1)ELS-01X is made after 2005. This problem will not happen. You don't have to replace PN1 Sheet. many thanks for a straight forward purchase and shipping of the Vita-rise upgrade unit. It arrived safely a few days ago and I've installed it without any problems. I took the opportunity to change the colour of the Electone trim to white to give the organ a new look to complement its upgrade! I can't wait to find my way around the new sounds. Yamaha have modified the unit slightly since you issued the fitting instructions. There is no longer a switch on the circuit board to change language to English so it would be best to delete that bit from your instructions. Although it didn't take too long to remove the cover and search for a switch which wasn't there, it would be best to skip that bit! I attach a photo of the board which shows the new layout without the switch. They have also deleted a small circuit board on top left (compared to your photo in the instructions) internet board?. I simply changed the language option to English via utility screen. I also suggest a small but useful addition to the instructions. When installing the power cable, attach string tightly to the top of old cable before extracting it downwards, then after pulling it through to the bottom, remove the old cable and tie the string to the new cable end to pull it back upwards through the inside of the leg. A potentially very awkward and difficult job made easy! Photo attached. We got success story from who has Export model STAGEA (240V) in UK. Please use the feedback as you suggested. I'm very happy to say the vitarise kit was successfully installed. I have attached a photo! - 240V, 50 Hz Power supply. - No speaker connectors between main console and speaker box. The DM box and speaker box are hard-wired. 1. remove the old 240V power supply from the ELS-01C DM box. 2. remove 110 volt power supply from the Vitarise kit. 3. Replace vitarise power supply with old 240V power supply from ELS-01C. 4. Remove Speaker connector in Vitarise unit. 5. Replace with old speaker connector from ELS-01C DM box. With regards to points 1-3 above, the engineer said he thought the power supply maybe a universal 240V/110V supply, but he could not be sure. Steps 4-5 must be completed on any export model Stagea. The export models have a wire connecting the DM box to the speaker box. Japanese models have connectors which are not used in the export models. I hope this may help you. Please do contact me for more information. As an introduction, I should explain what the vitarise unit consists of. 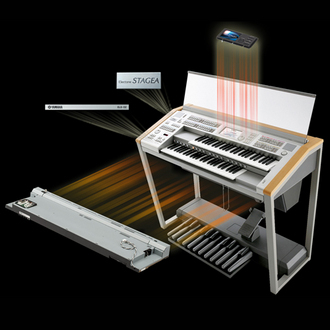 As well as the larger screen, the vita-rise upgrade has an entirely new DM box, which is the metal box contained in the lower part of the main electone console. The DM box contains most of the boards and processors that make the electone work. The DM box also contains the 220 volt power supply. There are two main differences between the ELS-01C export model Stageas (that we have) and the Japanese models. 1. 100 volt power supply. 2. Connection of speaker box underneath the main electone keyboard unit. When you receive the new DM box, it will have a 110-volt Japanese power supply pre-installed. It is NOT 220/100 volt switchable! You will need to ask your engineer to take out the old power supply from the ELS-01C DM box and install it in the new ELS-02 DM box. There is also a new power chord supplied - it is now a standard EU “8” power plug. On Japanese ELS-01C electones, there were plugs installed on the wires connecting the main keyboard unit to the speaker box. This was so that people could disconnect the speaker box when taking the electone apart for transport. In the export models, Yamaha did not build in this facility. I have attached a picture of my modification to make my electone do the same. On yours, you will find that there are no plugs at all. I guess what you will have to do is ask your engineer to disconnect these wires from the old ELS-01C speaker box and reconnect them to the new ELS-02C DM box. This sounds difficult, but is actually quite easy. These are the only two issues that I remember. I wish you good luck with your purchase and please let me know if I can be of any further help to you. As promised I send you some pictures with the instalation differences between stagea export models and japanese models. Like Cris already the only difference are the speakerunit an powerunit. I hope the picture make it even cleare for those people who have an export model. On page 4, step 1 my DM box only had 21 screws. The screws on the bottom next to the bottom left and right corners no longer exist. When I'd finished and powered on my Stagea the VA buttons on Lead Voice 2 didn't work. I initialised the Stagea through the Utility menu and that fixed the problem. The only step I failed to manage was step 9 on page 10. I mistakenly assumed the upper unit was hinged on place and managed to lift the whole upper unit off the lower unit before realising it wasn't. As I had it in my hands I just placed it on the floor and so didn't use the support units. It's probably worth mentioning in your instructions that the upper unit is only resting in place. This is probably the only step where having two people to lift it would be beneficial. All in all, your instructions were detailed and precise and allowed me to follow them with confidence. Have received the Vita 02 Update and everything is OK. Has only taken about 2,5 hours to install. Your “how-to-do”-instructions are great and very detailed. At the end I have removed the old Yamaha-sticker and wanted to replace it with the new logo. I have cut my finger very hard on a sharp edge of this metal-logo. This logo sticks very good on the organ. So be carefull when removing. Cause of that I was not able to play the organ just testing some sounds. And what should I say: better than I have expected. Thanks for your great support and best greetings from Austria ! 29th Dec 2015. We dispatched Vita rise unit (For ELS-01C) to London UK. Many thanks.